The sun did come up. 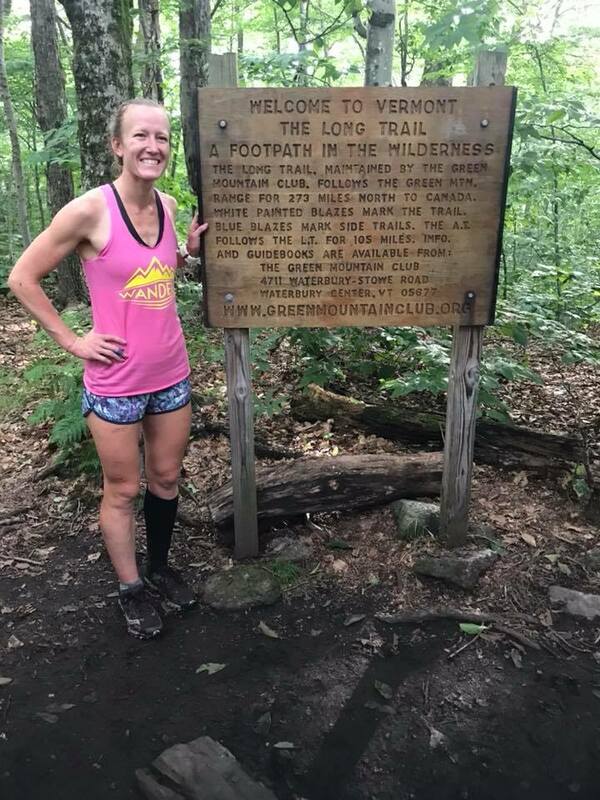 - Alyssa Godesky, the women’s fastest known time record holder for the Vermont Long Trail. This is how a Smashfest Queen looks after trekking/running 273 miles. Amazing. 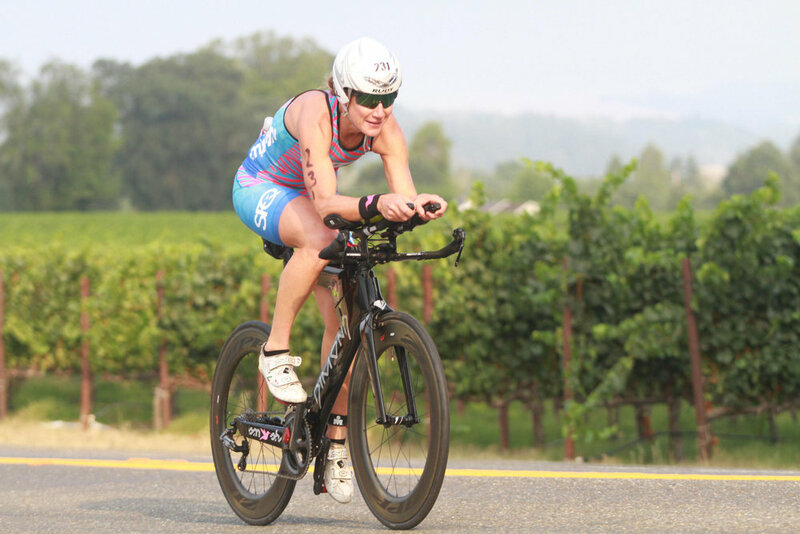 I cannot even wrap my head around the magnitude of that level of human endurance, so I won’t, instead I will share how I raced a half Ironman on Saturday, or, more accurately a 56 mile bike ride, and 13.1 run in the gorgeous countryside of Santa Rosa, California. In transition waiting for the fog to lift with my teammates, Eva Frieden and Hallie Nicoll. Photo courtesy of Hallie Nicoll. This was a brand new way for me to start a race, the first of a few “firsts” throughout the day. I cannot say that I was disappointed not to swim, but not because I didn’t want to swim, I feel pretty good in the water these days, and the long ramp up to transition would have helped my cause, (the more running opportunities throughout any race the better for this tall lady), rather what I felt was relief. It felt like we were getting away with something, similar to how it felt growing up when we had some alternative function to attend on Sunday mornings and didn’t have to go to 7:30A mass. This is not the right mindset to have going into a race. I was excited to get up to my old Vineman stopping grounds to visit and race, but the fast girls showed up for this race, so it would be really tough. Thankfully, Hillary tuned me up perfectly to handle the faster efforts on the run, my fitness was there, but something felt off. We’ll explore that existential moment later, but first…. 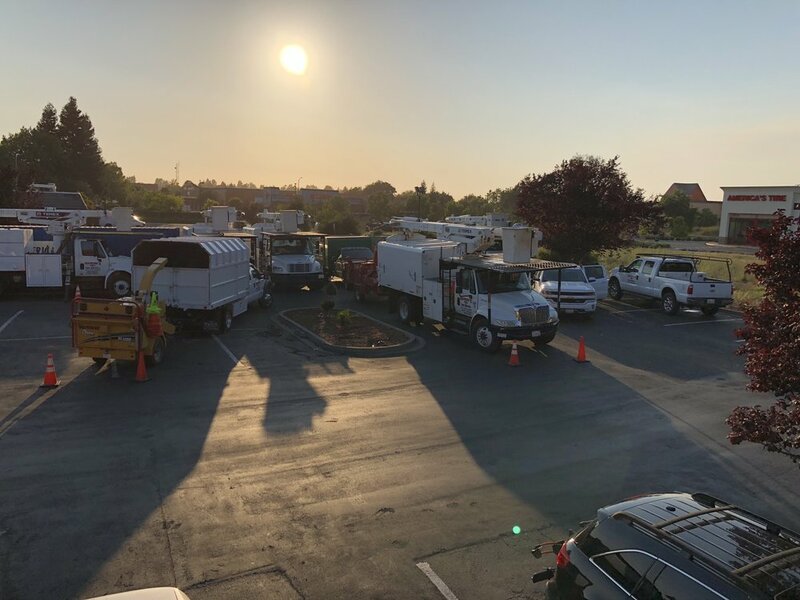 Before the agonizing, nearly hour long bus ride from downtown Santa Rosa up to Lake Sonoma on Saturday morning, I spent the night in a motel that was the popular after hours gathering spot for every utility worker in Sonoma County. Also, the previous guest clearly cared more about their appearance than I did, because I found an eyelash extension on the bedspread. Now, I am not a germ-a-phobe, I have a pretty high grossed-out threshold, but finding that tiny treasure did skeeve me out. However, the circumstances were out of my hands, because I found out that morning that the hotel I had booked, over-booked, so they tossed me back to hotels.com corner, who matched me up with Rohnert Park’s finest freeway adjacent establishment. Nevertheless, I did sleep soundly, and accrued the most race eve zzz’s to date, so let’s cut the complaining right there. In fact, that Thursday night before I spent a fun evening with my sister Sarah and her boyfriend Eric at their hip spot in the Presidio. Sarah made us a delectable re-enactment of my pre Boston marathon dinner, yams with sautéed kale, and a delicious salad. After nearly eight hours of driving, (the final two spent crossing over the Bay Bridge), I was famished and ready to eat and chill. My sister Sarah's delicious and nutritious plant-based culinary masterpiece. Yours truly and Simone moments before we started our sojourn north. Speaking of Simone, (my Dimond bike), she was excited to race; maybe, too excited. We went for an easy spin on Friday afternoon along one of my favorite stretches of Dry Creek road that I pedaled over numerous times on my previous dalliances at Vineman, but never on Simone, and she knew it. She made it very clear on that short ride that she would carry me faster than any other bike had on that course. “Okay.” I replied surprised and embarrassed. But, I wasn’t drafting? I don’t even know how to draft? I kept those thoughts to myself, made the pass, and tried to calm Simone down, she felt horrible. I smiled and said out loud, “Well, that is your first penalty in ten years of triathlon, relax.” And I did. When I pulled up to the Penalty tent about ten miles up the road, I was surprised to see a full house. There were two pissed off girls in front of me, frothing at the mouth to get back out there. I was not mad. I felt terrible, and just wanted to be cool and wait out my time. “How long do we have to wait?” I asked the kind, and busy volunteer. “Five minutes.” She replied flatly. My stomach dropped, and Simone sulked her head even lower; five minutes is a long time to sit on the side of the road watching your competition pedal further up the road, especially in a short race like a half Ironman. Still, I was not nearly as upset as the girls in front of me, which I am not sure is a good thing or not-so good thing? Were they just being poor sports? Or, did they simply care more about their performance than I did? I think it was a bit of both. Once I was released from my unscheduled pit stop, I pedaled away thinking I definitely shot myself in the foot, I was waaay far back now, but I still had a half marathon to run, so it was time to drop the hammer and let Simone do what she does best, go fast! A criminal and her get-a-way bike. Cut to: Standing still at a train crossing at mile fifty-five of our fifty-six mile ride. Sure, I’ll tack on a couple more minutes to my time; why not just keep the theme of the day going? After I finally dismounted my bike, I had to run the length of a football field down the racks in transition to find my spot and change for the run. As I was exiting transition, the great Mirinda Carfrae was finishing her first lap, and sped right past me heading out for her second and final lap, safely in first place. As a true running fan, seeing her gait up close and personal was something I will never forget. She possesses such power and precision, it is just remarkable. Anyway, I was feeling good, too, and clipping along at a decent 7:05ish pace, slightly under what I planned for, but I was ready to blow it out on this run, because I figured what else could possibly go wrong? Making the needful early run adjustments to my race belt. I cruised through the first six miles feelin’ good, and then my feet started to heat up and hurt. This sensation was upsetting, but not surprising. I made a poor decision to wear a lighter pair of shoes that I usually save for the treadmill, or for sub eight mile runs, but never any distance longer than that. Moreover, I need to be on top of my shoe arsenal because ever since I changed my gait in 2009 to land on the balls of my feet, the balls of my feet need a bit more cushion to handle the impact, if not, the friction is too much, and they start to burn. My tried and true shoe, the New Balance Fresh Foam Zante, arrived too late in the week to sufficiently break in for this run, so I rolled the dice, and went with the more broken in New Balance 1400. Bad choice. I tried not to think about the pain, but every step felt like I was being jabbed by a blazing hot wrought iron poker. Not fun. I kept my pace up for a while, but once we reached the trail section on the second lap, around mile eight, the rocks poking through my shoes were agonizing and threw off my form. I tried to keep my spirits up, but with each slowing mile my fire started to fade, and shame flared up. What a tool. I have literally run thousands of miles, learned this lesson repeatedly, and STILL thought my feet could handle it, nope, they couldn’t. I tried to finish the race with as much dignity as I could muster, but once I crossed the line I just wanted to hide in a shadowy corner and disappear. Wishing I could keep running straight to my Jeep. Miraculously, that could not happen. I was forced to stick around for nearly two hours because they weren’t releasing our bikes and gear bags until 2PM. Awesome. You know what? It was awesome. I spent the next couple of hours chatting and getting to know my teammates better, all who had excellent races and placed first in their age groups, amazing. It was fun and humbling to be surrounded by such talented athletes and inspiring women. I did feel embarrassed that my 7th place finish could not hold a candle to their well-deserved accolades, but it didn’t matter, we were all finishers of an odd race with our own story to tell. Also, no matter where I finished, second or 10th, with or without the bike drama, I still would not have been satisfied. No race performance will ever be good enough. I am still upset about Alaskaman, my marathon performance at IMAZ still haunts me, and even my PR finish at Boston has tortured my psyche for months because that was four minutes longer than I wanted to run. I am always disappointed. Is that a healthy way to live? I’m not sure. What I do know is that I have experienced shifts in my body and mind over the last decade being a triathlete that I never dreamed were possible when I signed up for my first race. Sure, triathlon has broken my heart about a thousand times along the way, but I thrive on my ambition to improve, because I know with hard work and a positive mindset it is possible to achieve high reaching goals. The truth is, all of 2017 I had this unwavering confidence that spawned from pure joy of the sport, progress, and success. 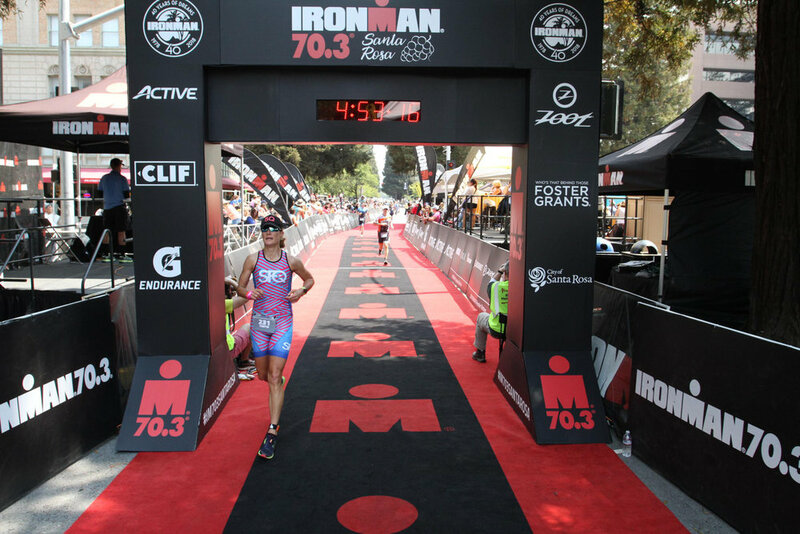 This year started with that confidence rattled at triathlon camp, not feeling quite as solid as my teammates on the bike, and that confidence never quite rebounded throughout my sketchy prep for Ironman Boulder. However, what I woke up realizing yesterday, was every day I get to train is an absolute blast. I am in incredible shape for any human being, let alone a laaaaaate thirties woman, and in this race called life, I am doing alright. Plus, I don’t think I am meant to be the best, I am meant to be my best. Therefore, even though I finished Ironman Santa Rosa, 70.3 with shattered pride, Simone was intact, new friendships were born, and I achieved a better perspective on where exactly I am in this sport; a long way from where I started, but still far away from where I want to go. It is time to take a deep breath, buck up and ready myself for the next, and most important training block of my tri-life, prepping for Kona.